LONDON – Taxing financial transactions in Europe would directly decrease the value of the savings and financial products held by almost all citizens of European countries, and would directly affect economic stability of the EU. The implementation of a financial transaction tax in Europe would have widespread negative effects on the value of individuals’ savings, even in countries not directly enforcing the tax, according to the results of new research released on February 18th by the UK consultancy group London Economics. The research assessed the economic impact on household savings arising from applying a 0.1 percent tax on selected financial products and instruments traded in participating EU countries, as was proposed by the European Commission in February 2013. 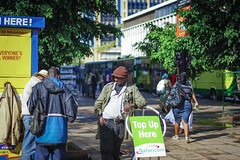 HARARE – Many everyday payments in Zimbabwe will now be liable for an extra 5 percent tax, as a new levy is applied to all mobile money transactions in the country. Last week, starting from January 1st, a new tax on mobile money transactions came into effect in Zimbabwe, levying ZWD 0.05 charge on all transactions through such systems. The new tax is intended to bring the tax treatment of mobile transfer systems in line with the current tax treatment of ATM and bank withdrawals. According to some experts, the tax was put in place due to pressure from the country’s banking sector, which saw the rising popularity of mobile transactions services as a threat to commercial appeal of traditional banking products. BEIJING – China is looking to use new tax measures to reduce excessive currency fluctuations and to eliminate unwarranted market risks. Late last week in an article in Quishy, a publication of the Central Committee of the Communist Party of China, the head of the State Administration of Foreign Exchange of China Yi Gang said that new studies will be conducted into the feasibility of introducing a tax on certain currency exchange transactions. The potential tax, which is similar to the so-called Tobin Tax, would be levied on all spot conversions of RMB to another currency, and is designed to reduce the potential profits on high-risk speculative currency trading. NAIROBI – Errant taxes could endanger Kenya’s burgeoning mobile cash transfer services, likely hurting the financial situations of the country’s poorest people. In a speech given at the annual general meeting of Safaricom, one of the biggest telecoms operators in Kenya, the Chief Executive Officer of the company Bob Collymore warned the government that taxes targeting financial transactions conducted through mobile phones are endangering the country’s financial system and hurting numerous people who rely on such services to make payments. ROME – Italy has become the first country in the world to enforce a tax specifically on high frequency trading activity. In a statement issued on September 2nd the Ministry of Finance of Italy announced that a new tax of 0.02 percent has been instated on high-frequency trades of stock and derivatives transacted on the Italian national stock market. The new tax will be imposed on any transaction performed within a time frame of 500 milliseconds of initially being lodged, regardless of the physical location of either party. Concerns have already been raised that the new tax could hurt the national stock market, as high frequency trading activity is often claimed to provide liquidity and price discovery mechanisms.